Music And Lyrics: Burt Bacharach And Hal David The legendary composer and lyricist -- who collaborated on tunes like "Raindrops Keep Fallin' on My Head," "I Say a Little Prayer" and "What's New Pussycat?" -- discuss their 50-year relationship and some favorite tunes from the Broadway revival of their musical, Promises, Promises. 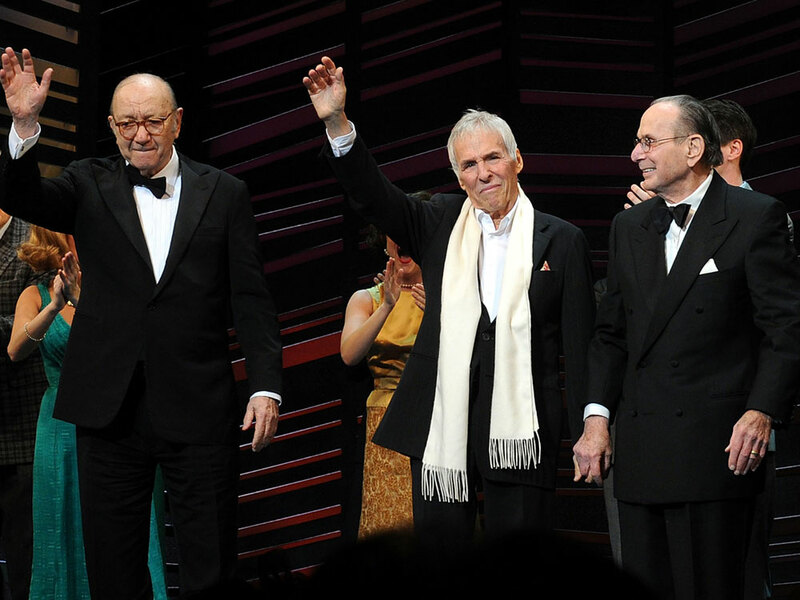 Writer Neil Simon, composer Burt Bacharach and lyricist Hal David take the stage after the opening performance of Promises, Promises. The musical is based on Simon's book, The Apartment. Lyricist Hal David and composer Burt Bacharach began their collaboration together in 1957 after meeting in New York City's legendary Brill Building -- the home of dozens of music publishers, as well as songwriters such as Carole King, Neil Sedaka and Paul Simon. Only a year later, their song "The Story of My Life" hit the U.S. country music charts. Soon afterward, Perry Como recorded their song "Magic Moments," which also climbed the charts. But it was in 1961, when Bacharach and David started their collaboration with the sultry pop star Dionne Warwick, when they had their biggest string of hits. Between 1961 and 1981, Warwick charted 38 singles co-written or produced by Bacharach and David. Their song "Walk on By" became one of Warwick's classic numbers, along with "Do You Know the Way to San Jose?" and "Wishin' and Hopin'," which was also recorded by Dusty Springfield. During the '60s and '70s, Bacharach and David also wrote for some of the biggest names in the recording industry, including Tom Jones, Gene Pitney, Bobby Vinton and Lou Johnson, who released the first version of their hit "(There's) Always Something There to Remind Me." In 1966, the duo began to release movie theme songs, including Alfie, What's New, Pussycat? and The Look of Love. Their work in movies led to Broadway: A year later, they were asked by producer David Merrick to collaborate with Neil Simon on the musical Promises, Promises. Based on the Simon book The Apartment, the musical stars an insurance salesman named Chuck Baxter whose boss uses his apartment for romantic liaisons. The show originally featured Jerry Orbach, Jill O'Hara and Edward Winter and ran for several years in New York City before moving to London's West End. 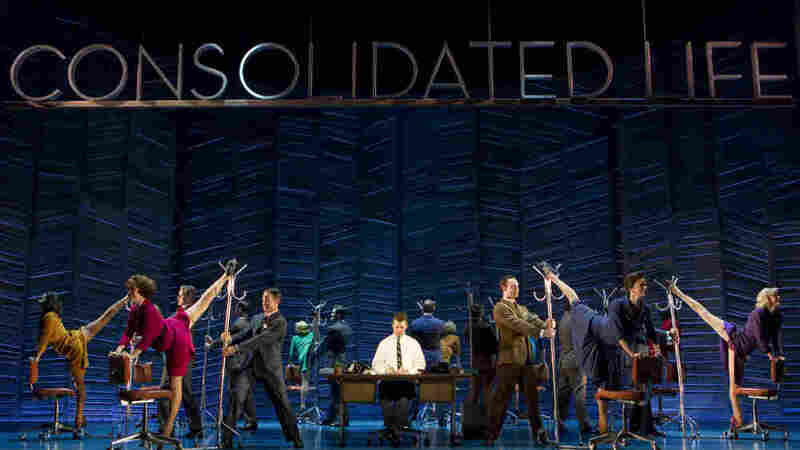 A revival opened on April 25 and stars Sean Hayes and Kristin Chenoweth as the musical leads. Though Bacharach and David would create several more hits together -- Isaac Hayes' "Walk on By" and B.J. Thomas' "Raindrops Keep Fallin' on My Head" among them -- they ended their collaboration in 1973, shortly after the release of the critically panned movie musical Lost Horizon. "I drove up to the opening-night theater having just read the Los Angeles Times review, and I just wanted to get out of town," Bacharach says. "And I wanted to go down to Del Mar -- I had a little beach house there -- and hide and not write and just play tennis every day. Even though my attorney said, 'You'll get in trouble with Hal if you don't write for Dionne Warwick ... I just ignored his advice. As far as responsibility, it's on me." "Whatever it was," David adds, "we've been friends ever since." In 1993, the duo reunited -- after 20 years of working solo -- for a new Warwick song, "Sunny Weather Lover." They recently collaborated on another new song, "You've Got It All Wrong," for the revival of Promises, Promises. As of 2006, Bacharach had written 70 Top 40 hits in the U.S. He recently performed at the BBC Proms with the BBC Concert Orchestra, as well as at the Walt Disney Concert Hall in Los Angeles. Burt Bacharach: "I remember coming to New York, and we'd come to see the show after it'd been playing, and I'd go backstage and [original cast member Jerry Orbach] would say, 'Man, if I have to sing this song again...' Granted, it is very notey -- in other words, it is not an easy song to sing. My motivation is the urgency that makes it work, dramatically. Or you think it's going to work dramatically by the anger that comes through in that many notes, in that many words. But Jerry, after three months, he was saying, 'Why'd you have to make it so difficult?' "
Hal David: "When Burt was hospitalized with pneumonia..."
Bacharach: "It was, like, maybe three days after we opened in Boston, too. And we had good reviews in Boston." David: "We thought we had a hit. But there was one spot in the show, where we had a song called 'Wouldn't That Be a Stroke of Luck?' or something similar to that..."
Bacharach: "That's a good title, though." David: "But we threw it out. That song didn't work. Everybody [working on the show] liked the song, but the audience didn't like the song. And while Burt was in the hospital, I started writing lyrics for that song. The famous lines, 'What do you get when you kiss a girl / You get enough germs to catch pneumonia after you do / She'll never phone ya'... I don't recall thinking that Burt was in the hospital and had pneumonia, but obviously that's what I wrote." Bacharach: "And we wrote it really quickly." David: "I gave you a lot of the lyrics. I think we wrote it in one day." Bacharach: "The day I got out of the hospital." David: "The day you got out of the hospital, we played it for Neil [Simon] and David Merrick, and they put it in the show the next day. And it stopped the show like a Hollywood movie. It just stopped the show." 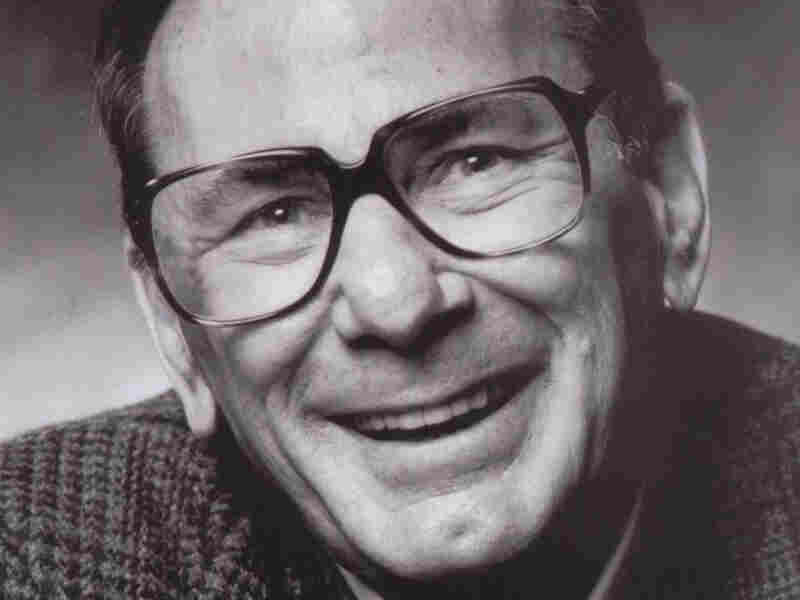 Hal David began writing lyrics in the 1940s for Sammy Kaye and Guy Lombardo. 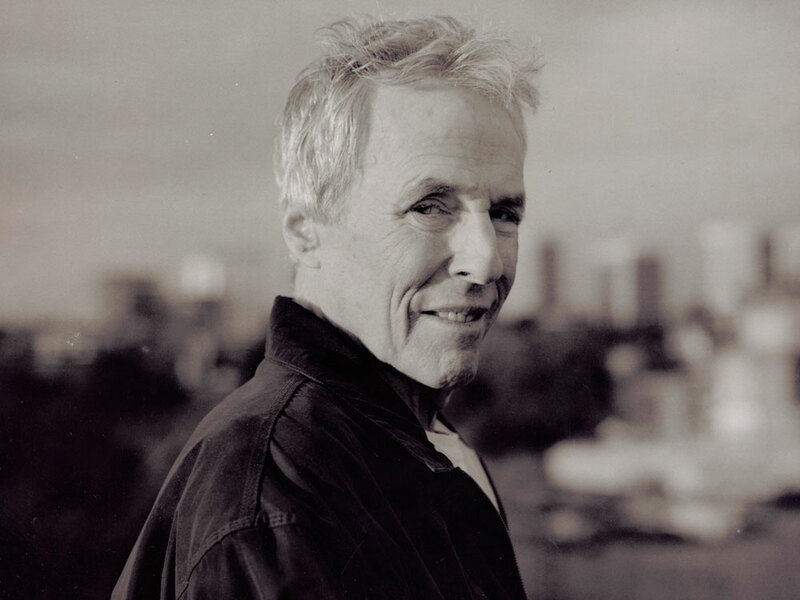 In 1984, he was elected to the Nashville Songwriters Hall of Fame. David: "It was important to me. And I think it was the most fun time I had on any project I've done." Bacharach: "If I hadn't gotten sick, I would have had a good time. By the time we did the cast album, I was just looking to get to Palm Springs and not touch a piano for a while. So we should have written another one, but shoulda, woulda coulda." Bacharach: "It's a long story. I think we got involved with a motion picture that probably never should have gotten made. Making a movie musical with new songs -- it's not like you can go to Boston to try it out. The film is shot and the idea that you can replace a song and reshoot a scene [is not there]. The film was called Lost Horizon, and it presented its own set of problems and, I must say, I wrote the score and the background score as well as writing the songs with Hal. Songs sounded good. I mean, they still sound good to me." David: "The score is a very good piece of work, but the movie just didn't work." Bacharach: "There's a song in the middle of the movie called 'If I Could Go Back' that Peter Finch's character sings. And it's about his longing -- whether he stays in Shangri-La or goes back to England. He has a chance to do either one. And when we made the song for that particular soundtrack, it sounded great. I thought, 'Jesus, it's beautiful.' And then when you see it in the movie, you're sitting there and you just don't care whether he goes back or stays. It doesn't make any difference. You don't care about him. ... I didn't want to write anymore. Period. I drove up to the opening-night theater having just read the Los Angeles Times review, and I just wanted to get out of town. And I wanted to go down to Del Mar -- I had a little beach house there -- and hide and not write and just play tennis every day." David: "Whatever it was, we've been friends ever since."